I've always loved Dresdens. 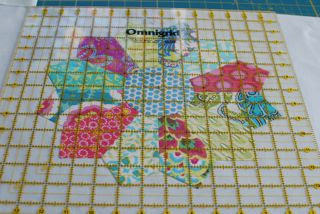 It's one of the first blocks I tried many years ago in very traditional fabrics. There's been a revival and I had to try some with a modern twist. I'm starting with my Amy Butler Soul Blossoms and adding on from there. I've read lots of tutorials online and mashed them together in my own way. So in case you want to know, here's how I'm doing mine. 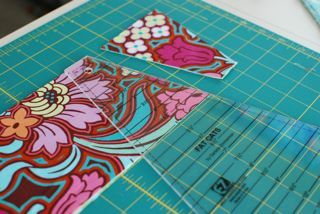 To cut the wedges, I'm using a Fat Cat ruler by EZ. It's a 30 degree wedge, so you need 12 wedges per block. They're somewhat fatter than the traditional Dresden, but I think they show off the bigger prints better and I like "fat". I cut a 5" strip from a fat quarter. (5" x 21"). I'm cutting 4 wedges from each fabric, flipping the ruler up and down. I can also get 6 - 2" squares from the leftover of the strip. 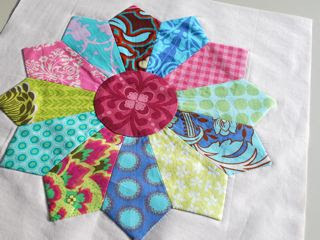 My plan is to make a sashing of 2" squares. 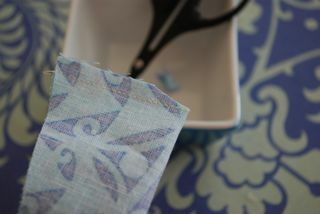 Fold a wedge in half long ways and stitch across the fatter edge. 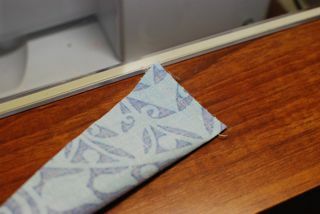 Trim the corner off on the folded side. 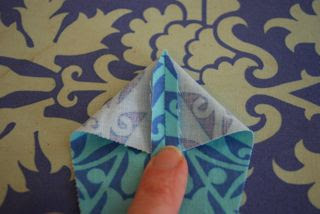 Keep the wedge folded in half and finger press a crease along the length. Finger press the seam open. Use a point turner to turn the wedge right side out. 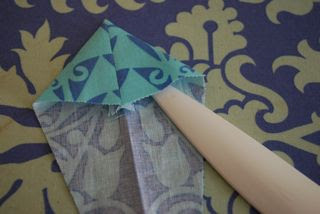 Match the seam to your finger-pressed lengthwise crease; press. Sew your wedges together. Try to be very accurate with your seam allowance if you want it to lay flat. Be sure the outside edges meet exactly - don't worry too much about the inside edge. Press the seams open. Give your plate a nice firm press with steam and make it very flat. For the center circle, I use a 3 1/2" heat resistant circle template, trace it to my fabric and cut it out leaving 1/4" seam allowance. Run a gathering stitch (I do it by hand) around the circle. Place the template in the middle and pull up the gathering. Pull it nice and tight, so you have a nice smooth edge. 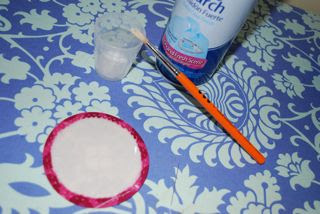 Spray some starch into a cup and use a paint brush or Q-tip to starch the seam allowance. Iron well - with the template still in place. Flip it over and iron again. 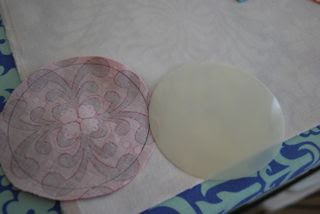 Once the starch is completely dry remove the template. You can pull up the basting stitches a little to reform a perfect circle. 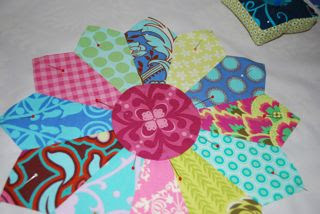 Pin everything to your background and applique. I'm doing it by hand - I can do one in 90 minutes (sorry, yes, I time myself). 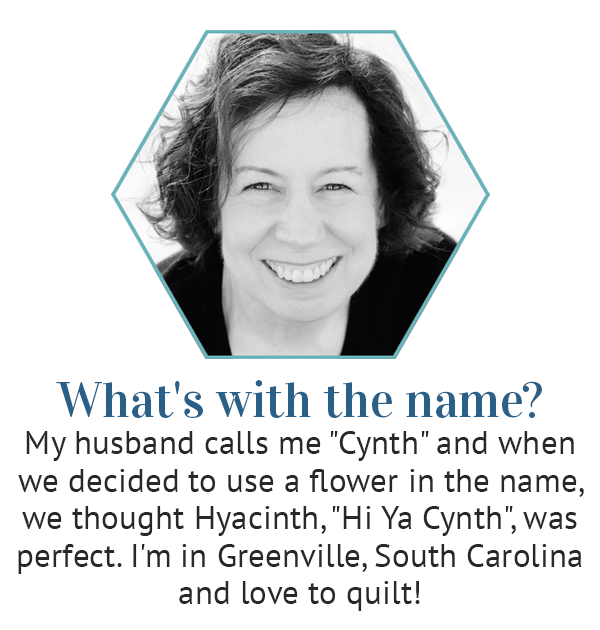 You could also machine stitch with a straight stitch, a zig zag stitch or a buttonhole stitch. I always make my background oversized and trim down once the applique is done. 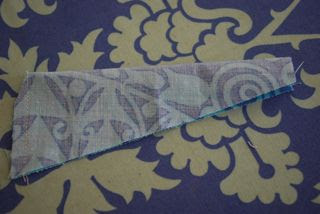 Trim to 14 1/2" by lining the 7 1/4" mark along the center seam line between the wedges. 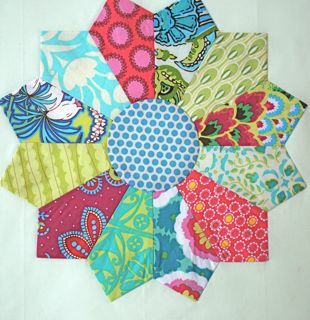 My plan is to applique 6 blocks on very soft, pastel Kona solids and 6 blocks on Kona Snow. Two down - 10 to go! They look great, but I'd for sure be doing them by machine. I'm not patient enough for the hand work! I love the hand sewing! It sounds beautiful. I can hardly wait to see the blocks together. 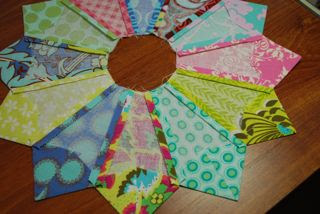 I love these fat dresdens...hoping I can find this ruler on-line...think I need to make some of these! Oh, I love this fat cat dresden! What a brilliant idea. Thank you for the great tutorial, it is step by step visually and written. Really great! Wow, what a small world we live in. Just last week I decided to make a Dresden quilt. I saw a couple of them posted on a few blogs and thought they were beautiful so I ordered a Easy Dresden and "Soul Blossoms" material. I thought it would look nice. Now I stumbled upon your blog and found this post, haha. I do like the fat dresden better, and just as I imagined the fabrics do make a pretty dresden. My fabric arrived yesterday. I can't wait to get started!! oh thank you for this post! 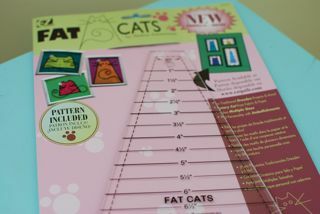 i recently received the fat cat ruler from an online friend and was disappointed when the instructions mentioned nothing about how many wedges you needed to make the dresden block. i had no idea this was a 30 degree wedge, and i now see that 360 divided by 30 is 12, but i appreciate this post so much! esp since again, the instructions did not include a cirlce template like her skinner dresden ruler. Beautiful! Love the idea of using pastel backgrounds, too. Cindy: I pinned this tutorial, I really want to do this some day. Need to get the ruler. May have to purchase it online. Thank You. I love how detailed your tutorial is. Thanks for sharing. I will surely make this.